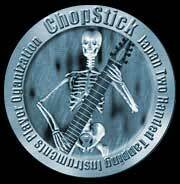 I had been living in Hiroshima, Japan for 5 years when I first became aware of The Chapman StickÔ in 1998. Immediately fascinated by this incredible instrument and new method of making music, I spent days scouring the Internet for as much information as I could find. After reading (numerous times) every English website I could find devoted to The Stick, I then turned my attention to a search for on-line Japanese resources. I was disappointed when I discovered only a handful of Japanese websites with Stick-related information.However, in the four years since then, I have learned that the maxim "quality over quantity" certainly applies to the state of Stick enthusiasm in Japan. And, if the crowds I've seen surrounding the Chapman Stick booth during demonstrations and performances at the Japan Instrument Fair in Tokyo, the number of attendees at seminars, and the enthusiastic audiences at concerts are any indication, interest in and knowledge of The Stick in Japan are steadily increasing.Below, I briefly introduce three outstanding players, a Stick enthusiasts' club/mailing list, and Stick Enterprises' official sales representative in Japan. I assure you that The Stick is alive and well in The Land of the Rising Sun ... and these guys have the chops to prove it! KATSU discovered The Stick when he was a student at the Berklee College of Music in Boston. While pursuing a major in jazz guitar, he studied The Stick on his own time, and formed the band "STICK MAN", which was active in Boston from 1985 to 1986. Following his graduation from Berklee in 1986, KATSU returned to Japan in 1987, where he continued to play The Stick live while acting as producer on a variety of projects. In 1988, he signed with Yoroshita Music, which also managed Ryuichi Sakamoto at that time, but left after one year to pursue an independent career. The following year he performed The Stick regularly in a duet setting with saxophone, and then in 1990 founded his own music and mutlimedia production company, Carifa, Inc., in Tokyo. 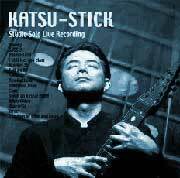 In 1998, KATSU released "KATSU-STICK", his debut solo Stick CD. The album contains 12 original tracks, including "Sussex", evoking the artist's image of a morning in Sussex Garden, London, and "Snow", based on his memories of winter in Boston where the snow seemed to swirl endlessly in the wind. KATSU ends the CD with three jazz standards: "Bluesette", "Israel", and "The Days of Wine and Roses". KATSU uses an unconventional tuning, with both sides of his 10-string Ironwood Stick tuned in straight 4ths within the range of the guitar. Of his playing, Emmett Chapman has said, ígHearing (KATSU) play clean, unadorned jazz melody lines accompanied by guitar styled chords and vamps, I am struck with the interwoven intimacy of both elements - a jazz guitarist's dream.íhCurrently, KATSU is working on a Stick method book, while continuing to perform The Stick solo. Toshi Fujita first discovered The Stick in 1990, when he was living in California. While visiting a guitar store to purchase parts, he saw a Stick for sale and asked to try it out. Although generally confident in his ability to play stringed instruments, he found himself utterly lost on The Stick. As a result, he bought it on the spot. Toshi told me that, thinking back on it now, the frustration that he felt in those first few moments with The Stick was probably what compelled him to buy the instrument and master it. Toshi played The Stick for about 2 or 3 weeks, before putting it in his closet and focusing once again on guitar. It wasn't until about 6 years ago, when he and some on-line friends formed the Chapman Stick club/mailing list ígChopStickíh, that Toshi finally took his Stick out of the closet, replaced it with his guitar, and began to get serious about tapping. In 2001, he released ígNot 4 Saleíh, his debut CD as a solo Stick artist. For Toshi, the appeal of The Stick is the ability to improvise freely, with complete arrangements, as a solo act. He wanted to make a recording of live, unaltered, improvised music, and ígNot 4 Saleíh, with all 9 original tracks recorded in one take without overdubs, is the fruit of his efforts.Toshi recently performed solo for an enthusiastic crowd as an opening act for Don Schiff's performance/seminar in Tokyo. I've had the wonderful opportunity to see Yukinobu Kasuga perform twice; first as an opening solo act for Bob Culbertson in October 2001, and then again in April 2002 as an opener for Don Schiffífs performance/seminar. Previously a guitarist in a rock band, Yukinobu was influenced by the music of Trey Gunn and switched to Stick in 2000. 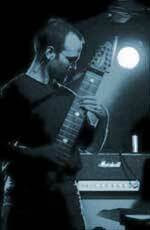 He hopes to release his debut CD of original tunes later this year, played solo on Chapman Stick and with looping. 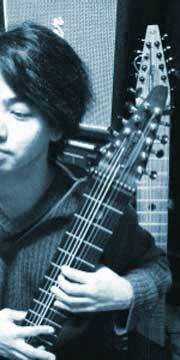 In addition to his solo work, Yukinobu currently plays his standard tuning, MIDI Grand StickÔ with two bands. ígBody Lotioníh is a hard rock/jazz group consisting of guitar, drums, and Stick, with a sound that Yukinobu describes as similar to that of the American band Tribal Tech. His other band, ígMokujiníh, is a drums, bass, and Stick trio that improvises over a Trance beat. Both bands perform regularly in the greater Tokyo region. 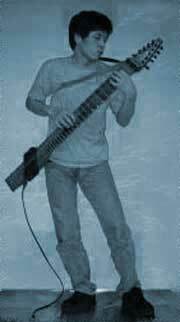 The ChopStick club for players and enthusiasts of the Chapman Stick was created in the summer of 1995 by several Japanese players who first met on the Stickwire mailing list. Since its founding, the group has held five ígStick Night in Tokyoíh events as well as five workshops.The group plans to hold one Stick Night and two workshops annually. In June 1999, ChopStick released ígOmnibus CD Vol. 1íh, a collection of 13 original songs written and performed by various members. Currently, the group is planning a concert event to be performed live over the Internet. In February 2001, Emmett Chapman announced the signing of an agreement between Stick Enterprises and Ishibashi Music Corporation for the exclusive sale of Stick instruments in Japan. In addition to supplying all 8, 10, and 12 string Stick models, accessories, strings, CDs, and videos, the knowledgeable staff at Ishibashi Music Store in the Shibuya section of Tokyo organize and promote Stick and NS/Stickÿ clinics and concerts. The Stick Center thanks Kevin Ramsey's collaboration for this article.